Geert-Jan van Beijeren Bergen en Henegouwen graduated of the Groningen conservatory, was director of various amateur choirs and adjudicator at choral festivals. His great talents were recognised when he was the only Dutch conductor admitted to the 2005 edition of the prestigious Eric Ericson Masterclass, taught by Simon Halsey and André Thomas. 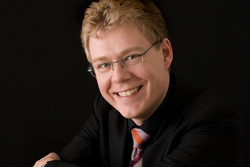 For his performance he was appointed assistant conductor of the Netherlands Radio Choir in the 2006-2007 season. He has since been asked regularly to guest conduct this choir, as well as other professional vocal ensembles. In 2009 Geert-Jan won several prizes with his ensemble Cantatrix. He won the 1st prize as the best conductor of the prestigious competition “Seghizzi” at Gorizia, Italy.